Did you know that cacao trees where chocolate comes from can only grow within 20 degrees both North and South of the Equator? In the Tropical Zone — just below the Tropic of Cancer to just above the Topic of Capricorn. Though it encompasses the entire globe, it’s still a small world. And I bet you didn’t know that the cacao pods come in almost every color of the rainbow — I only learned that when I started reading more about chocolate. 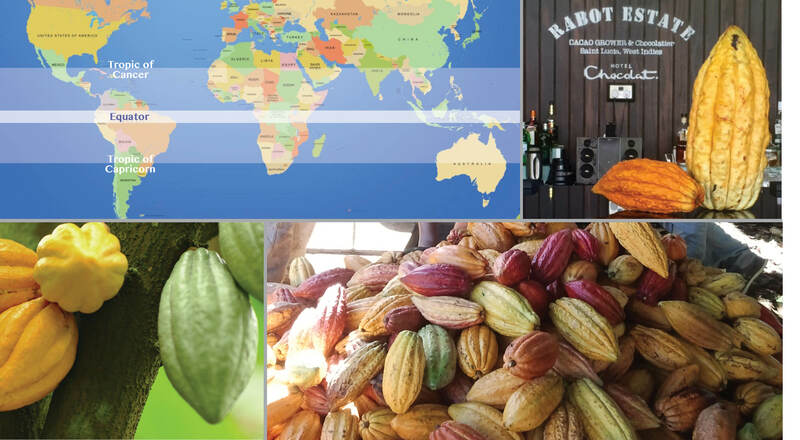 Interesting new discovery on the island of Saint Lucia — a giant 6.6 pound cacao pod was harvested from its tree at the Rabot Estate plantation on the grounds of the Boucan Hotel Chocolat. It measures 14” long with a circumference of 19”, it may be the largest cacao pod on record. A normal pod is typically 1-2 lbs! My friend Roxanne Browning of Exotic Chocolate Tasting got the chance to see it in person.